Countdown to the Pan Mass Challenge! What are you doing on Saturday, August 1st? T-24 days until the PMC! Can you join me and volunteer for the massage therapy crew? Katie Adams here, and I have the honor this year of being “Table 1” of what we hope will be the first of 100 tables! 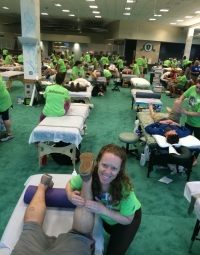 The PMC is the most incredible sports massage event I’ve ever worked in my 20 years of practice. The riders, who have amazing stories of why they are biking across MA for cancer, think we are the rock stars. Seriously, it stuns me every year how grateful they are to get a massage when they are the ones raised the money and it was their legs that did all the hard work! Therapists get parking passes if they have cars with massage tables inside (we need tables!). There is even a golf cart and assigned golf cart driver to help you bring your table to the massage room!! Note: PMC also has bus transportation from Boston if you need it. Time: The Massage Crew shift is 12 pm to 8 pm. Set up is at 11. Yup, it’s a long day, and it’s a Saturday, but hear me out: you are well fed and in air-conditioning. Also, I recommend you find a buddy (or better yet, bring a colleague) so you can share a table all day and take breaks to explore the festivities outside on the MA Maritime Academy lawn. Why? Your work will help the effort to cure cancer. And, for the riders, you will hear about who they love and who they have lost. You will meet riders biking 100+ miles with cancer diagnoses or who have survived cancer and want to give back. You will work with people from all over the country who come to participate in the nation’s largest fund raising event for cancer. I only hope you will feel as humbled and as inspired as I have every year. This event will stay in your heart forever.